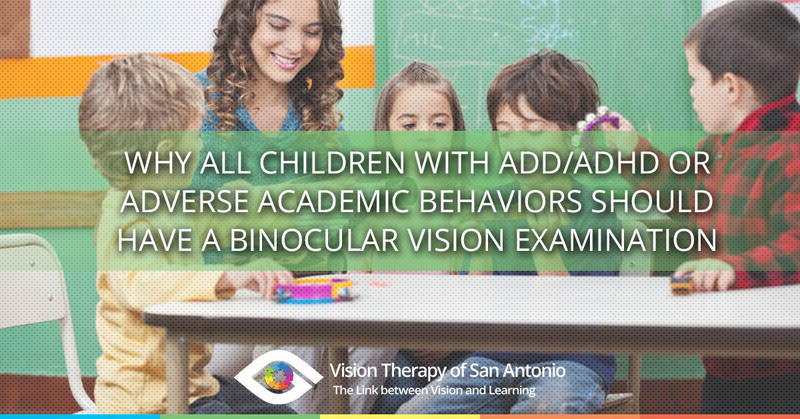 Vision Therapy San Antonio: Is it ADD or a Vision Problem? If you haven’t discovered the Vision Help Blog, it is a great resource of leading vision therapy doctors across the country. The blog posts are often geared towards other developmental/behavioral optometrists, but for those folks looking for answers for their loved ones, the average post is not difficult to understand. 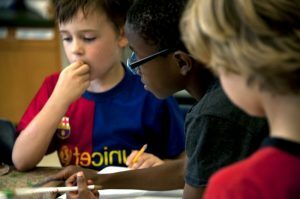 Dr. Dan Fortenbacher gets the credit for the post I’ve linked to titled, “Why all children with ADD/ADHD or adverse academic behaviors should have a binocular vision examination.” He brings up an interesting question as to why health insurance plans will cover a lifetime supply of psycho-stimulant medication for ADHD but have little to no coverage for the vision development and rehabilitative vision therapy that could help correct the ADHD-like symptoms. Many eye doctors keep such a busy patient schedule and are so busy ruling out glaucoma and dry eyes that binocular vision disorders are overlooked because the eyes are correctable to 20/20. It’s so much more complicated than that. Give us a call if you suspect your loved one needs a good binocular vision exam in addition to the eye health/vision exam.